Wine, unlike most beverages, is very sensitive. It can spoil easily if exposed to light or heat. Wine requires specific conditions in order to mature properly. This is why, if you plan to start a wine collection, you need to understand the essentials of wine storage first. Wine can be stored in a variety of ways. One of the best is through a residential custom wine cellar in Dallas, Texas, with a quality wine cellar refrigeration system installed. In fact, this is the most ideal wine storage solution. Wine Cellar Spec, a leading wine cellar builder company, designed and built one of the most interesting custom wine cellars in Dallas. This unique wine cellar was built in a home in Frisco, a suburb of Dallas, Texas. Learn more about this home wine cellar by reading through this page. In one of the residences in Frisco, Dallas, Texas, Wine Cellar Spec converted a kitchen pantry space under a staircase into a lovely home wine cellar. The design of this custom wine cellar was made to match the existing home décor and maximize the given space. For this wine cellar, Wine Cellar Spec used wine racks made from rich Mahogany. 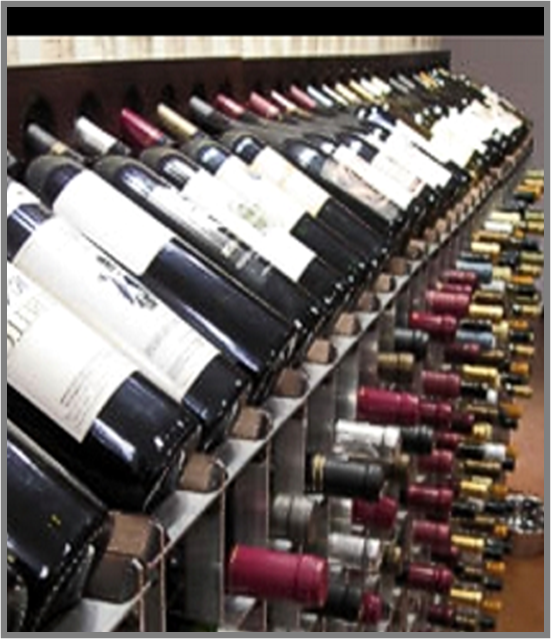 In order to accommodate bulk storage, lower double deep solid x bins were designed for the custom wine racks. A wine tasting table top was included too. Since the wine storage room was under a staircase, a full wall of horizontal single deep racks and a waterfall style rack were added, to complement the slanting ceiling. Lacquers and finishes are important, too, when it comes to wine storage. The wrong type of lacquer or finish can potentially damage your wine collection. In this residential wine cellar project in Dallas, Texas, not only did the wine cellar designer choose a lacquer that would complement the home décor, but also one that was non-aromatic. There are many wooden wine rack finishes that produce an odor that can ruin your wines. It is important to remember that home wine cellars are rooms that are tightly sealed, which means that even the slightest odors can build up after some time. Bad odors can affect not only the aroma, but also the taste of your wines. A wine cellar door is another important aspect of a custom wine cellar, because its design and build can affect the consistency of the temperature and humidity inside the storage room. For this home wine cellar in Dallas, Tx, the custom wine cellar door was built with a square top and an arched dual plane glass panel with a wrought iron inset. To match the existing cabinetry and molding style in the client’s home, custom stain was applied and custom made moldings were added. A wine cellar refrigeration unit provided by US Cellar Systems was installed in this wine cellar in Frisco, Dallas, Texas. 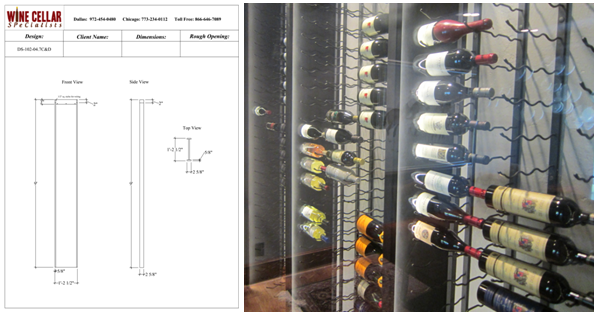 More specifically, a Rack Mount 2600 was chosen in order to meet the requirements of the wine storage room. Wine cellars in Texas need an efficient wine cellar cooling unit because the temperature and humidity in the state vary a lot throughout the day and through the seasons. A quality wine cellar cooling system can make sure that the ideal temperature and humidity inside the residential wine cellar are kept at constant levels. Wine stores and hospitality establishments need to use strategies to enhance their sales. This is why the demand for commercial wine cellars has been increasing not only in Dallas, Texas, but in many parts of the world. The main purpose of wine cellars is wine storage. Wine cellars provide wine the best climatic conditions needed for proper maturation. Well-aged wines make the drinking experience of customers memorable. Customers who love the wine from your store, hotel, or restaurant will go back again to buy more. They may even spread positive feedback about your products. In addition to ensuring that wines in your store are preserved properly, having a custom wine room in Texas also allows you to create custom wine displays. How you display your wines will affect sales generation of your business. Wine Cellar Specialists, an expert wine cellar builder, has recently designed stylish commercial wine racks suitable to Wine Down Wine Market in Flower Mound, Dallas Texas. With a relaxing atmosphere, this wine store offers a variety of wine suitable for any type of drinker. Wine Cellar Specialists used a mix of commercial and residential wine racks for this wine cellar with a capacity to house up to 3,398 bottles. All the wine racks were constructed from knotty alder wood. When you enter the store, the first set of Texas wine racks that will catch your attention are two round island wine displays at the center aisle of the room. The bottles around the top can be viewed easily in 360 degrees. Underneath them are columns where the bottles lay horizontally. 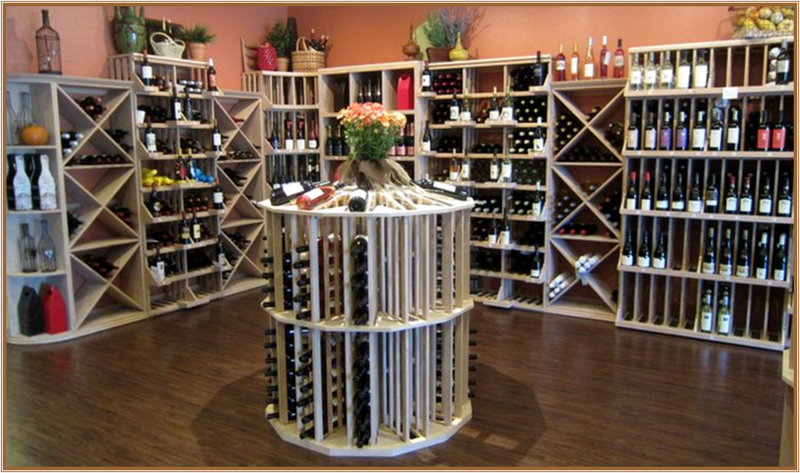 Round island displays are perfect for high traffic areas such as this wine store. The room was built in an L-shaped configuration. The left wall begins with a quarter round display rack. The shelves in this type of rack can be used to display wine accessories or large format bottles. On the left wall, a 2-column retail wine rack was placed in between 2 solid X-cube bins. A curved corner wine rack was used for a smooth transition to the back wall. The longest wall is the back wall. Here, you will clearly see that height differences create a big impact on the visual appeal of the whole custom wine room. The wine racks used were 3-column wine racks, solid X-bins, rectangular bins, horizontal racks, and retail stacker. The material from which your wine cellar racks are built contributes to the overall aesthetics of your wine room. Wine Cellar Specialists offers a wide array of wood in wine cellar construction such as mahogany, pine, redwood, and knotty alder. 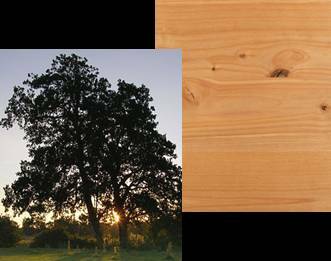 This time, they selected knotty alder which is a widely-used construction material for wine cellars. 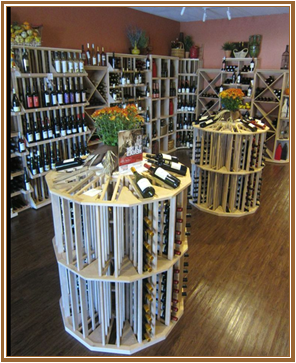 Knotty alder wine racks helped the wine store in creating high quality presentation of their products. This wood species contains small knots which add character to the wine racks. It is also known for its versatility, resistance to rot, and affordability. Do you have any space that you would like to transform into a commercial wine cellar and tasting room? Contact Wine Cellar Specialists today and grow your business with stunning custom wine displays. 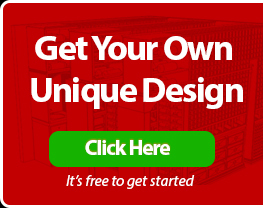 Request a FREE Consultation and 3D design by clicking here or visit their website at http://www.winecellarspec.com. In an area of a recreational lake in the city of Dallas, Texas called the White Rock Lake, a custom wine cellar built with iron and glass was completed by one of the most sought-after Texas wine cellar builders – Wine Cellar Specialists. The wine racks used were wall-mounted metal wine racks from Vintage View. A major advantage of this type of wine rack is easy viewing of the wine labels. Your guests can read the wine labels without any obstruction and find a specific vintage quickly. 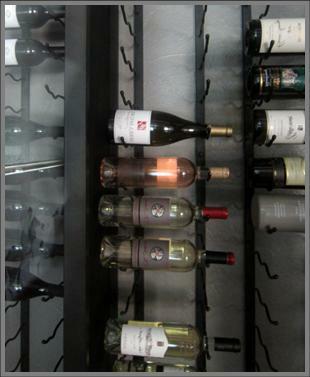 Wall-mounted wine racks are perfect for small spaces since they don’t occupy floor space. They are also decorative and can make your wine display a focal point of a room. If constructed and installed properly, wall-mounted wine racks can keep your wine bottles safe from falling due to intense shaking. At Wine Cellar Specialists, we always ensure that every Dallas Texas custom wine room we build will not only store our clients’ wines in an environment with constant temperature and humidity, but will also showcase their collection impressively. The wine cellar lighting is one of the crucial factors that contributes to the ambiance of a wine cellar and quality of wine. In this project, LED lighting was used. It was installed behind the front lips of the iron divider, creating a striking bottle display. See picture below. LED light is popular for its low heat emission, preventing the acceleration of wine’s aging process. To create the mood that our client wanted in his contemporary wine cellar, recessed LED lighting was installed in the ceiling. With our creativity and craftsmanship, the lighting created a clean and stylish look. An insulated iron frame and dual paned glass were used for the wine cellar’s enclosure to ensure that the cool air was maintained in this beautiful contemporary wine cellar in the White Rock Lake Area in Dallas, Texas. Not only must the wine room itself be insulated, but the doors and windows as well. Proper insulation of your wine cellar will prevent external factors from harming your wines. It will also eliminate the need for your wine cooling system to work hard when warm air gets inside your wine cellar. With this, you won’t be surprised by high electric bills. Wine Cellar Specialists have been using US Cellar Systems’ efficient climate control systems in their wine cellar projects. 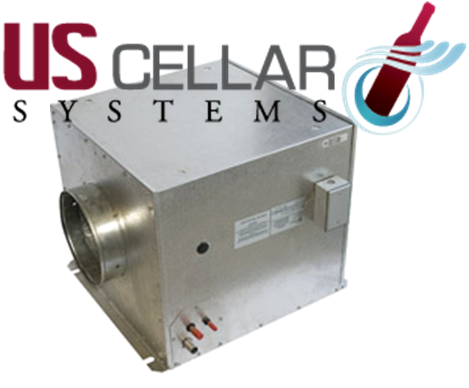 The cellar’s optimal conditions are stabilized by an HS4600 ducted split cooling system. We placed the compressor and evaporator underneath the floor and the supply and return vent of the system in the ceiling. Click here to watch the video of the project. This project shows Wine Cellar Specialists’ craftsmanship and quality of work and service. Visit their website at http://www.winecellarspec.com/.